We messed up. 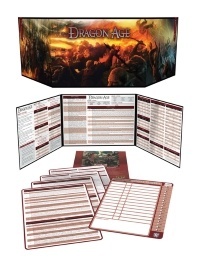 When we made the Dragon Age GM’s Kit, Revised Edition, we inadvertently printed the screen with the spellcasting block from the Fantasy AGE GM’s Screen, which we created at the same time. Please accept our apologies. The area on the screen to be covered by the sticker is 1.25″ x 3.25″, so you might want to print on a bigger sticker and trim it to that size.